Extra sheets and pillowcases come in handy for your toddler bedding. Fitted sheet is for a 28 x 52″ mattress. Pillowcase measures 20 x 30″ and fits standard size pillows. Made from soft 100% polyester microfiber fabrics. Bedding made for toddler sized beds that use standard 28 inch x 52 inch crib mattresses. Disney Frozen 4-Piece Toddler Bed Set. Quilt features Anna and Elsa. Pillowcase features Anna and Elsa and reverses to feature Olaf. DreamWorks Animation Toddler – Madagascar Behold My Mane 4-Piece Toddler Bed Set. This toddler set includes: quilted bedspread, fitted bottom sheet, flat top sheet and standard size pillowcase. Bring the sunny plains of Madagascar to your toddler’s bedroom, complete with wild and crazy Alex, Marty, and Melman! Features a reversible quilt with the trio of furry friends on the front and a geo pattern in blues on the back; fitted sheet with a colorful pattern of safari animals; coordinating blue and white patterned top sheet, and reversible pillow case featuring a lounging Alex and “I’m the AWE in AWESOME” on one side and the friends bursting out of a jolly jungle scene on the other. Fits a standard size toddler/crib mattress 28″ x 52″. Fabric is made of 100% Polyester Microfiber. Finding Dory – 4-Piece Toddler Bed Set. This toddler set includes: quilted bedspread, fitted bottom sheet, flat top sheet and standard size pillowcase. Float away to slumberland with undersea adventures of Dory and Nemo. The toddler quilt details a colorful ocean scene featuring Dory and Nemo playing in the coral reef and sea grass with all of their fishy friends; a coordinating flat sheet; a double-sided pillow case with Dory on one side and Nemo on the other; and a fun, fish patterned fitted sheet featuring silhouettes of Dory and Nemo in orange and blue on a crisp, white background. Fits a standard size toddler/crib mattress 28″ x 52″. Fabric is made of 100% Polyester Microfiber. 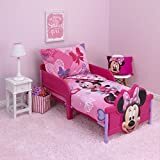 Disney Toddler – Sofia the First “Sweet as a Princess” 4-Piece Toddler Bedding Set Includes: Quilted Bedspread, Fitted Bottom Sheet, Flat Top Sheet and Standard Size Pillowcase. Princess Sofia the First is sweet-as-can-be in this charming collection. Sofia sweet as a princess with her tiara, jewels, flowers, hearts and castle are a few of her favorite things. Featured in fanciful shades of lavender, pink, raspberry, white, purple with a pop of yellow and aqua.. The sheet features a smaller all-over mini print of her royal tiara, jewels, flowers and hearts that complement this group. Made of soft microfiber fabric. Fits a standard size toddler/crib mattress 28″ x 52″. Machine wash separately in cold water, gentle cycle. Use only non-chlorine bleach when needed. Tumble dry low heat. Iron on low heat when needed. DOES NOT FIT TWIN BEDS; Made to fit toddler bed / crib mattress size 28 x 52 inches. Disney’s Mickey Mouse “Captain Mickey” Take flight with Mickey and his friends in this brightly colored toddler set. Bold and bright shades of blue, orange, yellow and red. 4 Piece set includes Comforter, Top Sheet, Fitted Sheet and double printed Pillow Case. Dimensions: 9 in. W x 11.25 in. H x 5.5 in. L Includes: Comforter, top sheet, fitted sheet and double printed pillow case Material: Polyester.